It's a collection of thousands of galaxies or more called a supercluster. 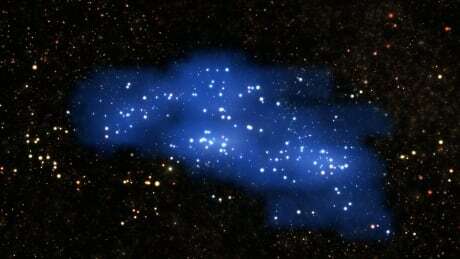 The formation is still in its infancy, so astronomers are referring to it as a proto-supercluster. Over billions of years, the galaxies will become more centralized as they are bound by gravity. While other proto-superclusters have been discovered, this particular one — which they have named Hyperion — is believed to be predate them by about three million years. In April 2018, an early cluster of galaxies (a proto-cluster) was discovered by a team of researchers including Canadians in the same region. Given the name Colossus, the 14 young galaxies were forming stars as much as 1,000 times faster than in our own Milky Way galaxy. "Thanks to theory, we can infer some sort of evolution of the early universe … and we have models that we infer how evolution of universe started," said Olga Cucciati of the Istituto Nazionale di Astrofisica (INAF) in Bologna, Italy, who is also the lead author of the study published on Wednesday in the Journal Astronomy & Astrophysics.